Let The Games Begin by Niccolo Ammaniti is a story about a party, a novelist, a singer, a satanic sect and a psychopathic property tycoon. Throw in a lot of alcohol, some elephants, and some fugitives from history and you get Let The Games Begin, where modern life combined with endless amounts of money causes chaos. When I first received this book I have to admit I was a bit dubious about it. I had read very little about it as the majority of reviews were in Italian, and I had never heard of the author. The novel seemed to be the most intriguing book on the list of titles to review, so I gave it the benefit of the doubt and I am glad I did. The synopsis tells you very little, and I think that this is both a positive and a negative. You go into the novel with little preconceptions, but you also spend a good deal of your time reading it wondering what on earth it is actually about. When I first started reading it immediately struck me that the writing was similar to Neil Gaiman, one of my favourite authors, in that it is full of wonder, you read unable to imagine how this story popped into the authors head as it is so full of creativity. This novel isn't one of fantasy though, but one of an extreme reality the likes of which would dumbfound a person if they were to be thrown into the middle of it, but it is a circus which celebrities and people in the public eye probably feel like they are often in the middle of. The novel is funny, that I cannot deny, but it is certainly not laugh out loud funny, it makes you smirk at the idiocy of the characters. It is a satire of modern life, and you can obviously draw similarities with celebrity culture, excess and materialism, and so you chuckle as you imagine that real life celebrities are actually that self centered or dim witted, or on the rare occasion, that self sacrificial. I enjoyed this book immensely, and I think my reading of it was only hindered by a couple of things, mainly that there was so much else going on in my life that I didn't get to just sit and read it. This is a novel which requires you to sit and pay attention because events unfold that wouldn't have even occurred to you as being possible. The second being that this is an Italian translation, and although it is a very good translation there are the odd words that stall the reader. I found it very difficult to get over the word Roman for instance, as I kept imagining centurions on Vespa's, and the odd few words are still in italian which I find makes it a little hard to grasp if you haven't knowledge of Rome or Italy and its trends in popularity. Having read this I do think I would consider picking up one of Ammaniti's other works, though I think there is potential for the reader to be disappointed if the tone is different in them. 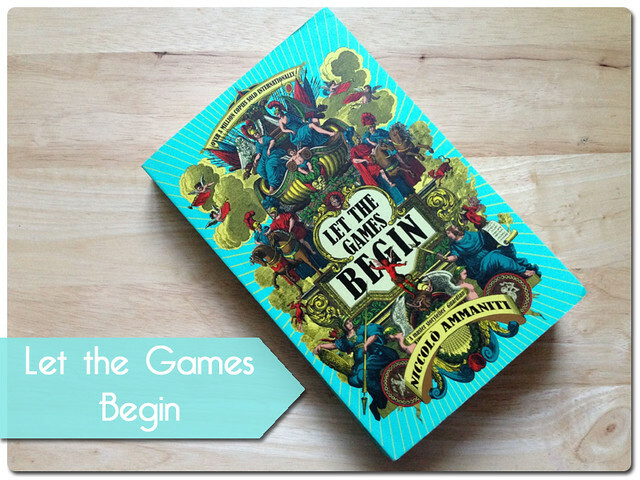 This is definitely the sort of book that not everyone would love, or even have the time for, but if you like to chuckle along with an utterly outrageous story then you might find yourself enjoying Let The Games Begin.